Reddit uses a straightforward structure for its subreddits (forums). The main URL, https://www.reddit.com/r/, is always the same and the name of the forum is just added to it. For the main Firefox forum, you'd go to https://www.reddit.com/r/firefox/ for example. Reddit users may sometimes want to jump to certain forums right away. While it is possible to subscribe to forums to get quick jump options while on the site or use bookmarks for that, another option that is available is to integrate the functionality directly in the browser. How that is done depends on the web browser. 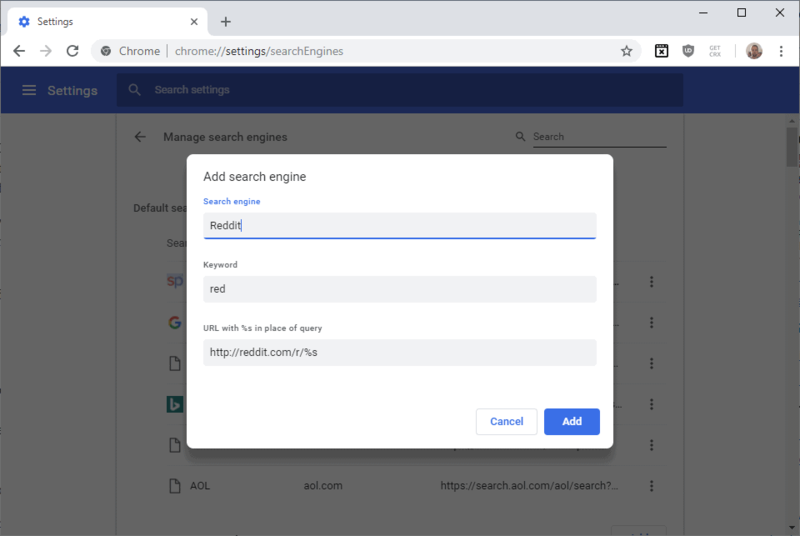 In Chrome, you'd add Reddit as a search engine, and in Firefox, you'd add it as a bookmark. Pick any name under Search Engine. Whenever you want to jump to a Reddit forum in Chrome, type re (the keyword you picked), then Space, and then the name of the forum. To go to the Chrome forum, you'd type re, then Space, then Chrome, and then return to get there right away. Note that the same method may work in Chromium-based browsers that are not Chrome as well. Firefox users may use the browser's bookmarking system for the same functionality. The process is a bit different from Chrome but the result is the same. Use the shortcut Ctrl-Alt-B to open the Library of the browser. You can also tap on the Alt-key and select Bookmarks > Show All Bookmarks instead. Switch to a folder under All Bookmarks, e.g. Bookmarks Toolbar. Select any name you want under Name. Use http://reddit.com/r/%s as the location. Add a keyword, e.g. re. Once you are done type the keyword followed by the name of the subreddit and then Enter to jump straight to it. 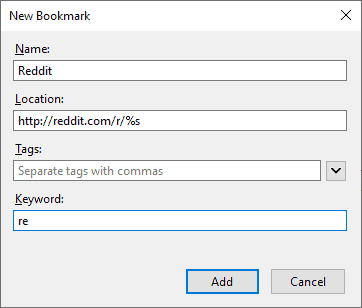 Find out how to add Reddit forum quickjump options to the Firefox and Chrome web browsers to jump to any subreddit immediately. Great feature. I will be using this for reddit and other sites i frequently use. Thanks for the heads up Martin! If you could stop ripping off my site, Martin, that would be great. Thanks. I did not rip this off your site. If you make such a claim, please back it up with proof. Don’t see anything like these tips on HTC. There are articles about apps, addons and extensions but not this. Too simple, I guess and only involves the user vs. third parties. HTC has some good stuff but too much ostensibly non-native advertising. This might be someone impersonating Chris Hoffman, so we shouldn’t quickly jump to conclusions. I’m just surprised he’s making this kind of stupid accusation publicly. Is there any way to find out the authenticity of that post, Martin? Is it really from him? I don’t know. We don’t record IP addresses and anyone can use any name or email address in the comment section. Thanks for the tips, Martin, it gave me some ideas to test. That means knowing exactly what the reddit names are. Except that the new design of rebbit is anything but quick. Especially on Gecko browsers. Anyway, this is a great idea for other websites as well! Yeah but that’s a problem with the inferior Gecko engine, made by the advertising company Mozilla who slips malware addons into their browser because they made deals with TV shows like “Mr. Robot”. Nonetheless, you can always use the old Reddit by going to old.reddit.com instead. You can also opt out of the redesign in settings so that you don’t need to change the url. That is true, moz://a is good for nothing these days, but the new reddit design is considerably heavier than the previous one. And old.reddit starts breaking more and more with every day passing. The overall quality of the articles here have been decreased so much lately. Soon you’ll publish “How to cook a noodle in 3 minutes”. if you don’t like the articles, don’t come back, I doubt you will be missed. Have to agree with your opinion. Many probably disagree with this sentiment. Case in point, you might have missed Martin’s excellent article “German Federal Office BSI publishes Telemetry analysis” just two articles up from this article. The pdf analysis will occupy an hour+ of time and has excellent tips, such as a method in analyzing the boot process of windows 10. Many of us would have probably missed it if not for ghacks. How-To-Geek ‘was’ one of my bookmarks for years, until they sold their soul to m$. I guess you do what you gotta do to get that cash. Honestly I go there once maybe twice a year nowadays. I usually use this under google search. FYI for me at least the shortcut to show all Firefox bookmarks is ctrl-shift-b, instead of ctrl-alt-b. Using bookmark keywords don’t look as good as using search engine keywords (with blue background) so I am using the “Search Engine Helper” add-on to make my own search engines. The addon is using file.io which is the perfect choice for the job. FYI you could just type firefox.reddit.com to get to the Firefox subreddit. This works for all subreddits.